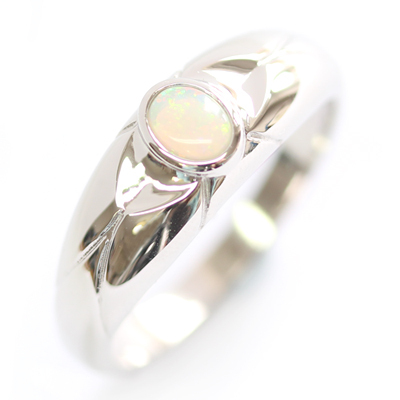 Palladium Opal Wedding Ring — Form Bespoke Jewellers Ltd.
A bespoke palladium opal wedding ring. Designed by the customer, this distinct wedding ring is part of a Palladium Matching Wedding Ring Set. From the start, the groom-to-be knew exactly what he wanted his wedding ring to look like and with the help of our expert Yorkshire jewellers, his design came to life. 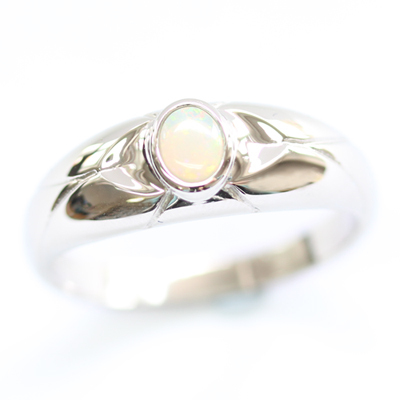 At the centre of the ring is an oval opal which has been rub set by hand for a neat, tactile finish. The width of the band tapers down from the opal and is detailed with bespoke engraving, again designed by the customer. The ring is cast in a trendy palladium. This was specially chosen to match the ring’s counterpart: a Palladium Plain Fitted Wedding Ring.